Glim, I am on Robinson Road so probably not too far from you. If you are able to get the van arranged just let me know where you want me to meet you. would you be able to recommend a van for these guys to use? I've uploaded an "Call Van" text file but the logistic company names are in Chinese. 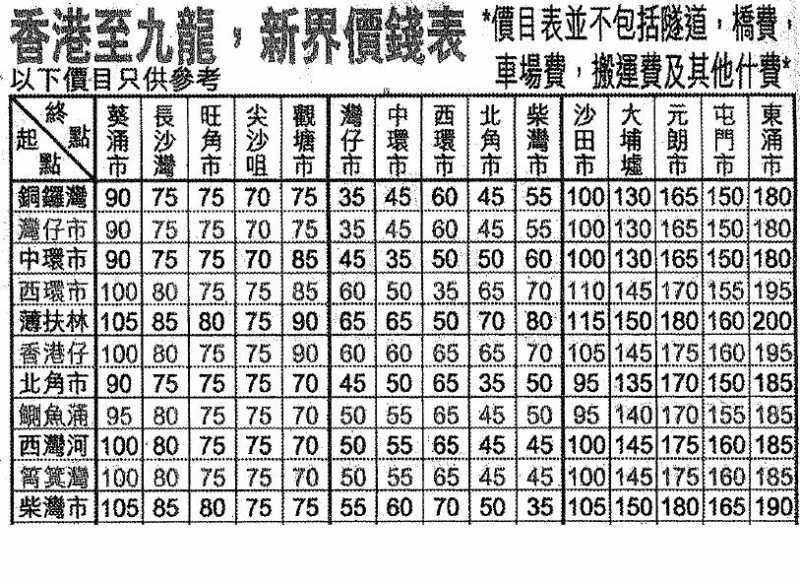 Also attached is a rate table(Chinese version) for Van transportation between districts. I scanned it from a newspaper last year so you may want to add 10% to the figure for inflation. The rate does NOT include toll / tunnel charges. Yes. Please get me the number and I will book the van. Who needs a ride from HK? I'm staying at Caine rd. I would like to join and would be able to share in the van if there is room.